McGowan Institute for Regenerative Medicine faculty member Bryan Brown, PhD, is an Assistant Professor in the Department of Bioengineering with a secondary appointment in the Department of Obstetrics, Gynecology, and Reproductive Sciences at the University of Pittsburgh. 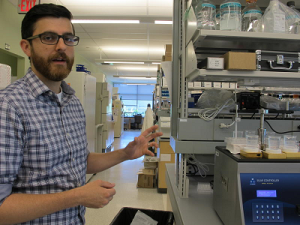 Recently, he discussed with Liz Reid of National Public Radio’s WESA his current research with different bioactive coatings to modulate the immune response to implanted devices. Dr. Brown is trying to figure out how to harness the immune system’s natural inflammatory response to better integrate these devices into the body. In his lab, researchers develop materials for different surgical applications and observe how the body responds using animal trials. “Inflammation can actually be productive in terms of helping an implant to integrate within the body,” Dr. Brown said. But in older mammals, including those people most likely to wind up with hip replacements and pacemakers, the response becomes less effective. Dr. Brown said figuring out what is different about the inflammation that happens following the implantation of a medical device in an aged animal versus young could help researchers find ways to make devices work better in the body. This is important, he said, because while we are living longer, we aren’t necessarily staying healthy longer.